The HP Z2 Mini G3 ($714.00 start, $1,698 as tested) is the latest version of HP’s small wonder, the ultrasmall workstation PC. While it’s still something of a curiosity, it may not stay that way for long. As systems get smaller, we’ve seen an ever wider collection of PCs gathering under the mini PC umbrella, as manufacturers apply the components and design lessons learned from laptops to pack more powerful capabilities into smaller desktop designs. 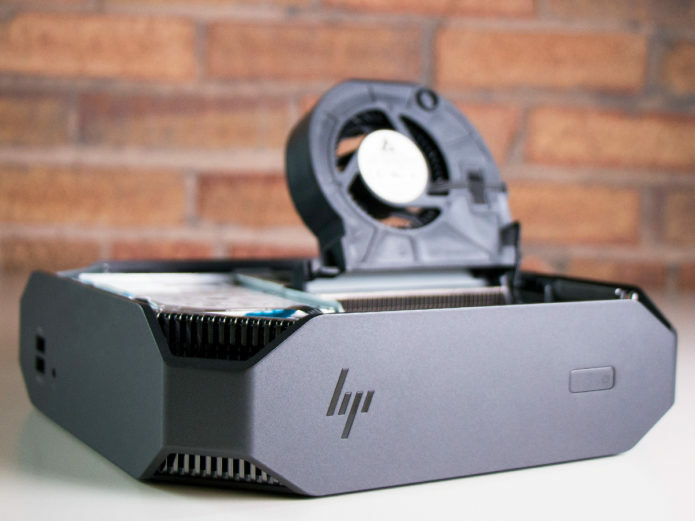 For the time being, however, the HP Z2 Mini is a rarity, cramming workstation-level components and ISV-certified graphics into a desktop PC that’s surprisingly small. The Z2 Mini lives up to its name, measuring just 8.5 x 8.5 x 2.3 inches and weighing 4.6 pounds. That’s bigger than other ultrasmall desktops, like the Asus VivoPC (7.5 x 7.5 x 2.2 inches, 2.6 pounds) or theAlienware Alpha R2 (7.9 x 7.9 x 2.2 inches, 3.4 pounds), but it boasts some beefier components and a chunky design that includes corner-mounted cooling vents.